This gorgeous, recently renovated villa in Wild Dunes is perfect for an upscale relaxing beach escape. The decorator designed interior features bright, colorful, and modern furnishings. The renovations include hardwood floors, redesigned kitchen with high end stainless steel appliances, tiled bathrooms, and brand new furniture. The first floor open concept living space allows you to enjoy watching the ocean waves or the 60 inch mounted television. A screen porch adds additional seating for meals, coffee, or conversation. Stairs from the porch provide access to the beach, community pool, and expansive lawn. This level includes a queen guest bedroom with semi-private, hall access bathroom. The second floor features two additional bedrooms. 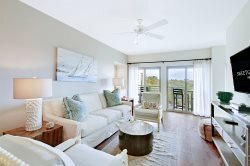 The beautiful master suite has ocean views from the private deck, a king size bed, wall mounted flat screen television, walk-in closet, and modern tiled bath with double sinks and large shower. The guest room at the opposite end of the villa is perfect for children, offering twin beds and their own bath. For convenience, the washer and dryer are on this level. The beauty of this villa, along with the views and access to amenities, makes this a special place to vacation. Start making memories.....reserve 27 Beach Club today! Very attentive to any needs that arose. Great location and property. Great view of ocean, grassy yard at back great, right by pool! Very clean. Easy access to beach. Amazing ocean view, breezes and well appointed villa! We would definitely book this villa again. They were the best I have every worked with in the past 5 years staying at Wild Dunes...much better than other rental companies in the area. Very satisfied! The house was a great location, very well appointed, and great beds for a rental. Loved it! Team was attentive and helpful. We loved the property location and the decor. View of the ocean. Easy walk to the beach. Beautiful screened porch with ceiling fan. Staff was very pleasant and efficient. We have stayed in many nice Wild Dunes condos over the years but this was our favorite. It is beautiful and welcoming with lots of nice decorative finishes. The kitchen had everything we needed when we cooked meals in. The screened porch has great furniture and was the perfect spot for morning coffee with a view of the ocean. The location was great, with beautiful views and easy beach access. The condo itself was gorgeous, with high quality finishes, and was well supplied with everything we needed. Loved it! Everyone I talked to was fantastic and very helpful. LOVED it! Plan on going back!!! They were very helpful and provided excellent communication before we arrived. We loved the property and were very happy with it! Thank you! WONDERFUL! Excellent location, stunning views. Very well furnished and equipped. Very comfortable. Sweetgrass was very easy to work with and most accommodating! Very high marks for ease of use and friendly service. Beautiful property with gorgeous views from both decks, master bedroom, and living rom. Very tastefully remodeled and furnished. Has all the amenities one would need for a family stay. We would be happy to rent this unit again. We recently enjoyed a nice fall vacation staying at 27 Beach Club Villa. The home's oceanfront location made it the perfect area for long beach walks, watching the ocean, and listening to the waves crash at night while sleeping! The interior of the home is very well appointed. It's obvious the owners spent time and money on the interior of the home. Hardwood floors, stainless steel appliances, and large flat screen TVs were just a few of the very noticeable upgrades. We especially enjoyed spending evenings on the screened in porch listening to the ocean! The pools located within each cluster of townhomes is very enjoyable! It's almost liking having your own personal pool! Water was still very nice late into October. The short walk to the ocean and its wide open beaches was perfect. We enjoyed a late day walk every evening in order to take in the sunset! Throw in the close proximity to Charleston and all the amenities that Wild Dunes has to offer, we'd definitely recommend. We enjoyed the Beach Club Villa over the last few days. All the updates to the condo were very nice and it was very clean for our arrival. As Sweetgrass mentioned, the view everyday from the condo is great. We certainly enjoyed the area and might look to spend some time back at Wild Dunes over the Christmas/New Year's holiday.